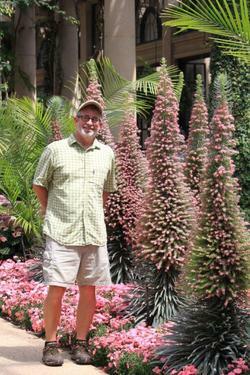 Dr. Martin Stone, director of the Baker Arboretum at Western Kentucky University, will be the guest speaker for the SFA Gardens' monthly Theresa and Les Reeves Lecture Series, slated for 7 p.m. Thursday, Sept. 8, in the Brundrett Conservation Education Building at the Pineywoods Native Plant Center. NACOGDOCHES, Texas - Stephen F. Austin State University's SFA Gardens will host the monthly Theresa and Les Reeves Lecture Series at 7 p.m. Thursday, Sept. 8, in the Brundrett Conservation Education Building at the Pineywoods Native Plant Center, 2900 Raguet St. Dr. Martin Stone will present "The Evil House of Roses: Why Josephine Bonaparte is Alive in Your Garden." Stone is the director of the Baker Arboretum at Western Kentucky University and holds the Leichhardt Professorship of Horticulture. The Baker Arboretum specializes in conifers and was recently recognized as an American Conifer Society Reference Garden. Stone has worked as a senior research scientist in California, a nurseryman in Lindale, where he grew roses in the wholesale market, at a garden center in Port Arthur and owned a garden center in Oklahoma, where he grew roses for the retail market. He has been a member of the WKU faculty for the past 12 years. With more than 100 popular and scientific articles published, Stone leads study-abroad trips to Ecuador, the Galapagos Islands, China and Costa Rica. He also is a local food organizer, who founded a farmers' market in Bowling Green, Kentucky, and lives on a farm with his family raising blueberries, blackberries, pawpaws and cut flowers. The Theresa and Les Reeves Lecture Series is held the second Thursday of each month at SFA's Pineywoods Native Plant Center. A rare plant raffle will be held after the program. The lecture is free and open to the public. However, donations to the Theresa and Les Reeves Lecture Series fund are always appreciated. For more information, call (936) 468-4129 or email grantdamon@sfasu.edu.